The APS 3090 P ERGON is a “3 in 1” system that integrates, inside the central column's structure, the palletizing, empty pallets feeding and interlayer insertion steps, i.e. the three operations usually performed by separate machines inside their own dedicated space. The integration of these three functions in the central column is made possible by a series of technical innovations devised by SMI designers. Specifically, the horizontal beam on which the layers loading head runs was fitted with a telescopic guides system that allows the beam to move faster on its transverse axis. In this way, the side of the column that remains clear when the packages are inserted into the loading head is exploited by the system to house the SCARA-technology mechanical unit that manages the flow of pallets and the insertion of the interlayers. This unit essentially consists of an articulated horizontal arm the far end of which is fitted with a gripper for grasping the pallets and a suction cups unit for handling the cardboard interlayers. The arm moves both vertically, sliding on the central column to pick up and release the pallets and interlayers, and horizontally, to transfer the pallets and interlayers from their magazines to the palletizing pallet. These operations are handled by the machine's automation and control system in perfect synch with the operations performed by the layer-loading head, so that the vertical and horizontal movements of the various mechanical units moving on the central column can follow precise and coordinated trajectories that prevent any contact or interference between them. APS 3090 P ERGON automatic palletizing system features all the advantages of Cartesian axes technology but with reduced machine overall dimensions compared to traditional solutions. The advanced technology used on the new APS 3090 P ERGON system allowed us to unify the three main palletizing functions in a single work center: picking up the empty pallets, overlapping the layers of packages and inserting the interlayers in between. 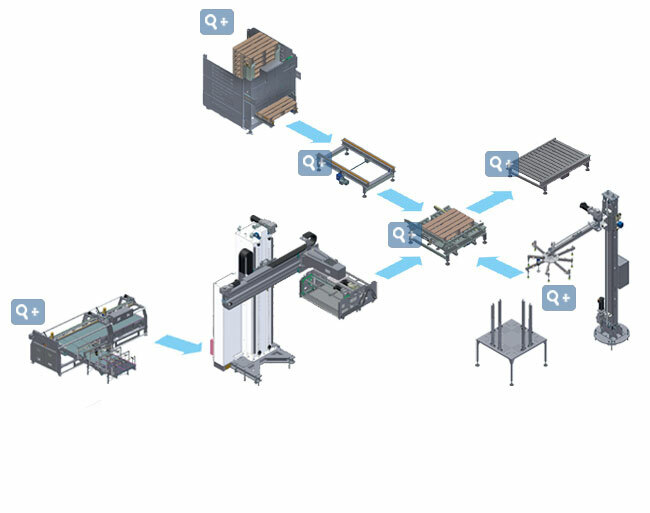 The integration of these operations within just a few mechanical units, all housed in the central column, substantially reduces the size and dimensions of the system and offers considerable advantages, compared to traditional palletizing systems made up of multiple standalone modules, as far as operating flexibility, work safety and machine maintenance are concerned. Yet, the compact configuration of the APS 3090 P ERGON allows concentrating the use of forklifts, transpallets, etc. in a well-defined zone, optimizing the management of the loading and unloading areas. In fact, since the pallets and interlayers are handled on the same side of the palletizer, this does not interfere with the other production activities. Thanks to its compact size, the new SMI system can be easily installed even in bottling and packaging lines that have limited space at the end of the line. The new APS 3090 P ERGON palletizer can be combined with a SMI shrinkwrapper or casepacker to form a PACKBLOC system, that eliminates the connecting conveyors between the two machines and allows you to save on the initial investment and line-end running and maintenance costs. Output rate: up to 90 packs/minute. The central column is actuated by brushless motors, which guarantee highly dynamic, reliable and precise movements of all axes of operation. The employment of this technology within palletization systems, which are characterized by repetitive actions, turns into higher reliability, fewer maintenance operations and lower operating costs. The machine automation and control are entrusted to the innovative Sercos Fieldbus technology, featuring an intuitive user interface for quick and easy management of end-of-line palletizing operations. A touch-screen display with advanced graphics and a complete array of utilities for real-time machine diagnosis and technical support further enhance the machine control features. In addition to that, the HMI will display automatically all possible palletization patterns just by entering the pack size and specifications, and the number of layers required. The accurate design of the column and of the horizontal beam, along with the creeping on recirculating-spheres skids, ensures fluid and uninterrupted movements, with nearly no dynamic buckling and virtual absence of vibrations: this is the key factor to be able to guarantee a lengthy life cycle of the mechanical components. The APS range of SMI palletizers is equipped as a base supply with the brand-new dedicated “safety PLC”, which allows to program all protection systems in a flexible, reliable and efficient manner. The PLC monitors the accurate functioning of all safety devices, integrating their performances, for a safe intersection between areas of handling inside the machine perimeter. This system enables to dramatically reduce machine downtimes, both in an emergency and during the pallet loading operation, the cardboard sheet loading operation, etc., thanks to dedicated solutions for each area of intervention. Maintenance operations are simple and easy, and the palletizing systems adaptation to future safety rules will be quick and troublefree as just an upgrade of the PLC software will be required. 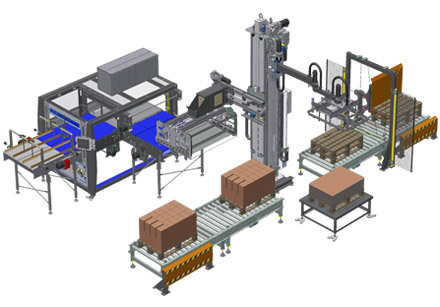 APS palletizing systems easily integrate into existing packaging lines or into new plants and can be set in motion immediately, since each single module composing the palletizer, conceived as an independent unit, is connected through a network to the central body. Thanks to this designing feature, each module is assembled, pre-cabled and tested at SMI production plant, thus minimizing assembly and start up operations at the customer’s site. For example, the central body can be easily disassembled, conveyed or stored in a small room, and later re-assembled and set in motion again in less than 5 hours. The mechanical simplicity, the employment of robot-based components and the structural optimization allow a remarkable reduction of the maintenance costs and of the energy consumption, as well as the extension of the machine life cycle. Layer-forming system with a double-entry infeed including 2 double rubberized cadencing belts, 2 row-forming product infeed belts, 1 one-way translation system that contributes to forming the layer. The layer is transferred from the belt to the basket smoothly and precisely as it exploits the belt's movement, and does not require the use of any mechanical layer translation components. The system, designed in accordance with FCR (Full Cost Reduction) methodologies, is tested in SMI factory and is supplied to the client fully assembled and cabled. The start-up consists of connecting the connectored cable of signals, power and sercos to the central module of the APS. The "3 in 1" fixed column hosts the mechanical elements assigned to the operations of palletizing, empty pallets feeding and interlayer insertion, i.e. three operations usually performed by separate machines inside their own dedicated space. Yet, the horizontal beam on which the layers loading head runs was fitted with a telescopic guides system that allows the beam to move faster on its transverse axis. The SCARA articulated arm integrates the empty pallets feeding and interlayer insertion functions. Start-up time is really short, since you just have to connect the connectored cable of signals, power and sercos bus to the central module of the APS palletization system. The APS palletizing system features an empty pallets feeding system combined with a roller or chain conveyor belt (according to the pallet loading and releasing direction). 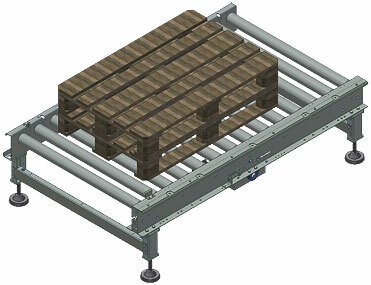 Storage capacity: some 10 pallets with maximum total height of 1700 mm. Designed in accordance with FCR (Full Cost Reduction) methodologies, this system is tested and is supplied to the client fully assembled and cabled. Interlayer pad feeding system adjustable in accordance with the interlayer pad dimensions. 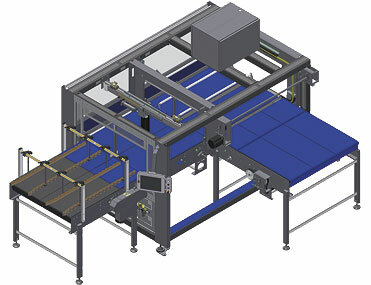 Controlled-axis pad-inserting group (depending on the palletizing system chosen), integrated in the central column of the APS palletizer system. Suction-cup gripping system from 4 up to 8 adjustable points, which ensures the accurate lifting of any kind of interlayer pad. Frame in zinc-coated steel and rollers with 76 mm ø 150 mm pitch, motorised through a 5/8 inch chain. Electronically reversible central motorization. The system is tested in SMI factory and is supplied to the client fully assembled and cabled. 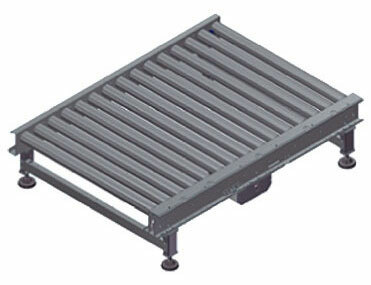 Available in different lengths: 1500 mm, 2000 mm, 2500 mm and 3000 mm.